Then Lord Tubby would certainly get one, with crossed swords, oak leaf clusters and bar. People who renounce their Canadian citizenship to accept foreign honours should automatically be stripped of the Order of Canada, as should people who disgrace the Order by being convicted of serious criminal offences. They stripped Alan Eagleson of his Order of Canada and, despite his being a complete and total crook and slipperier than a greased weasel, he did actually make a contribution to the country and to the sport of hockey. Unlike Conrad Black, the Eagle at least has the enough shame to accept that he did not deserve the honour. Unlike Eagleson who was instrumental in putting together the 1972 Canada-Russia series while lining his pockets, Conrad Black, has contributed zero to the nation. Anything he has done, he has done to line his own pockets and achieve his own ends. At the very most, I suppose it could be argued that he did do Canada a small service by taking Barbarella Amiel off the dating circuit, but I hardly think that saving a handful of media executives and faux aristocrats from here tender ministrations hardly merits the Order of Canada. If – and it is a big if – there has been a net benefit to the nation as a result of his actions, it has been purely accidental and more likely than not a result of his inability to figure a way to keep the cash in his own grasping, grubby paws. The board of advisors to the Order of Canada does not owe Conrad Black a hearing, it owes him naught but the back of its collective hand. 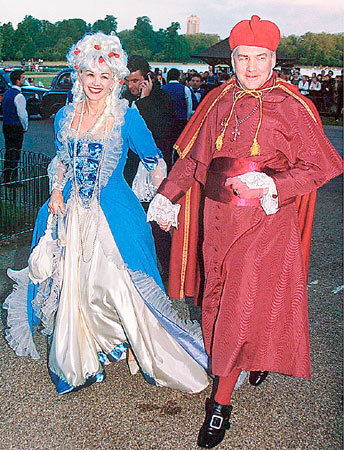 Canada owes Conrad Black absolutely nothing and as a convicted felon and foreign citizen he should count himself extremely fortunate that we allow him to enter the country at all. Though he did inspire a great song. "he did do Canada a small service by taking Barbarella Amiel off the dating circuit"
Better he had taken her off the pages of Macleans or anywhere else that one can find her lurid, sophomoric prose. She knows people! Famous people! For realz! Barbara Amiel is the person and picture I use to help others when they are unsure of the definition of the word "flinty". Uh, he wouldn't be able to run for US Senate as a non-citizen. He had a choice and he chose to be a British Peer instead of a Canadian citizen. No one forced him to do anything. That's glaringly irrelevant, and I could name the lower or upper house of any other Western democracy as an example. Black had to make a choice that our govermment imposes on dual citizens from no other country. That fact he is guilty of inflicting the National Compost upon Canada does not change the underlying principle here. Black was not a dual citizen. Canada has had a law on the books for decades barring citizens from accepting foreign knighthoods and such - which is why it was never Sir Lester B. Pearson or Sir Pierre Trudeau. Black became a British Citizen in order to accept a peerage and in the process renounced his Canadian citizenship. It was kind of a big deal at the time, you may have even read about it in the National Post, since that was what the paper was founded for - to defeat the Chretien govt because it wouldn't bend the rules for Black. At this point he is a British citizen with a prison record who holds a Canadian honour - the Order of Canada. He has been kicked out of the House of Lords over his criminal activity, although he cannot be stripped of his title except by the Crown. He should be stripped of his Order of Canada. Sure he should lose his Order of Canada. But he should not have been forced to renounce his Canadian citizenship in the first place. The Nickel Resolution is are resolution, NOT a law. Chretien was under no obligation to enforce it.